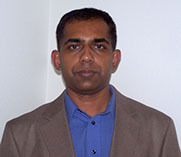 Profile: Dr. Piyasena received his BSc in Chemistry from the University of Kelaniya at Sri Lanka in 1997. He received his Ph.D. from the University of New Mexico in Chemistry in 2005. Dr. Piyasena leads a multidisciplinary research group focused on developing novel bioanalytical and biomedical techniques important for disease diagnosis, pathogen detection, and analysis of bio-molecular interaction. His group is also interested in new instrument development using microfluidic and acoustic techniques. Dr. Piyasena’s group has active collaborations with the Center for Biomedical Engineering at the University of New Mexico, and a startup company to build inexpensive microfluidic systems for BioMEMS applications. His research team is also working on promoting science and technology among local middle and high school students. Abstract: Microfluidics is evolving as a new platform for the development of miniaturized techniques that are advantageous for a wide range of bio-analytical and biomedical applications. A typical microfluidic device is comprised of single to multiple fluid flow channels with the width of few hundred micrometers, and many laboratory functions can be performed in these channels. The ability to integrate sound waves into microfluidic channels has further enabled the development of new arrays of bio-analytical devices with unique capabilities that are not achievable in macroscale. These devices typically need only a few microliters of samples and reagents; however, the devices’ flow-through layout is capable of handling several milliliters of a sample if necessary. We exploit these unique conditions to develop new miniaturized bio-analytical tools. In this talk, first, a simple and inexpensive new method of creating a microfluidic device on a commonly available aluminum substrate and its usefulness in cell separation and analysis will be discussed. In the second part of the talk, development of new cell and particle separation and enrichment technique by manipulating the microfluidic flow using sound waves will be presented.